Jana: Tell us about the concept behind Farashati. Farhana: Farashati is all about blending style and modesty. Customers who dress conservatively do not have to layer their clothes anymore to cover up. Our designs are in line with the latest trends and come with longer sleeves and longer length. For the Muslim woman, there is also the option of matching head scarf making it a one stop shopping experience. Jana: How did you go into fashion design – is it something you’ve always wanted to do? 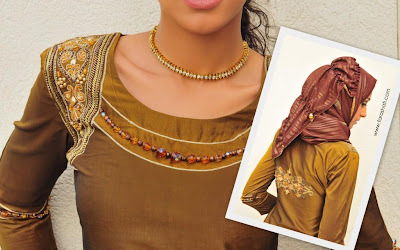 Farhana: As clichéd as it may sound, I have always been absorbed in latest styles and trends. I used to design for myself and close friends as a hobby and have always had diverse and contrasting interests. Farashati was conceptualised because of my passion for clothes as well as because I clearly saw a gap in the market for conservative chic styles. I started by involving freelance designers, but then got myself enrolled in a professional short course to take my hobby to the next level. Jana: Where do you look for inspiration when designing Farashati garments? Farhana: I am really fascinated by all things traditional and love to study the rich culture around the world. I started initially with an Indian designer and that’s why you will see a lot of ‘Kurti’ style tops in the website with side slits and traditional Indian hand embroidery. Personally, designs done by me have more Middle Eastern touch as I have lived most of my life in this part of the world, so the ‘kaftans’ you see are from my collection. Currently I am also fascinated by the rich tradition of Brunei and have been reading a lot on their traditional handicrafts but it will take some time to implement as traditional weaves are expensive as well as time consuming, and am still searching for a good weaver to do a collection inspired by Brunei. For the time being, my platter is full and I am in talks with an artist who is willing to make exclusive hand painting on our upcoming designs so the inspiration is definitely going to be from the hidden treasures of traditional crafts around the world. Jana: What have the reactions been so far to the brand in Dubai? Farhana: I have received lukewarm responses from retailers and investors so far – mainly due to the uncertainty involved with a new business offering a ‘different’ product – strikingly diverse from what is selling elsewhere. However there has been interest generated from other Gulf countries on the possibility of capitalising on this market as they realise that we are catering to a niche, an untapped market that is being ignored. Personally, I am happy when I see that my customers are happy. The recent Farashati Facebook fan page has given me immense confidence as more and more fans write to me describing the long suppressed need for the brand concept and their gratitude at having found this option. I had over 200 fans in the first week and have a 1000 + fans in little more than a month, so it feels great that my effort is being appreciated. I am sure the online shopping will be a great avenue for my niche group to shop confidently. Jana: Where do you see the modest clothing industry at the moment, and where do you think it should be heading? Farhana: Unfortunately they aren’t many companies doing modesty clothing. The only options here are the Abhaya and Jalabeya. There are a couple of online shopping websites but not any retail store that I know of that deals with modesty clothing. Relevant research figures strongly support the need for conservative fashion options. The survey revealed that over 96% UAE residents follow and practice Islam – a possible indication of the expected demand for conservative clothing. Farashati also conducted a dip-stick research on the shopping pattern among UAE residents, 30% of those surveyed answered in the affirmative about the regular use of head scarves, 54% wanted 3/4th if not full-length sleeves and 68% preferred tops that would cover their hips at the minimum – structuring the base of the Farashati brand concept. The modesty clothing industry has a long way to go but the awareness is definitely getting around. The Islamic Fashion Festival in Malaysia has been an eye opener and it was fascinating to see such beautiful designs showcased on the ramp with loose silhouettes and head scarves in place. The future looks bright. Jana: What are your hopes for Farashati in the future? Farhana: As any new entrepreneur, I have big hopes and big dreams for Farashati. There is so much to do. Our final aim is for Farashati to be a one stop shop for modesty clothing that is high on quality and provides excellent customer service. Apart from customer satisfaction, I also want Farashati to provide a platform for various artists and designers to come together and bring in a taste of their native traditions. Thanks for the article - Some of the design on their site are really nice. Though I am not from Dubai, I wish the local community would promote brands like these. Thank you :)...and yes we do ship to UK.